In the series of the SALV Model Table display, today we will see how to apply colors to the ALV Grid. 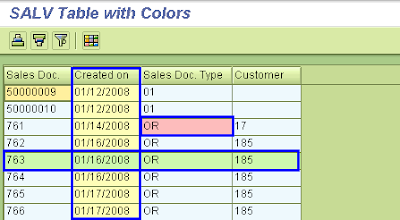 In this regards, we will see how to apply colors to the Specific Cell, Specific Row or Specific Column. You can find all the Previous discussion at Tutorials > SALV Table Display . Color plays a very important role in the formatting. It will help us to generate the a rich list which can help users to notice the exceptional data – for example, negative salary to employee or Low material availabilty. Perticular Cell: To apply color at perticular cell, we need to add the details about the field and color in COLOR table at each record. 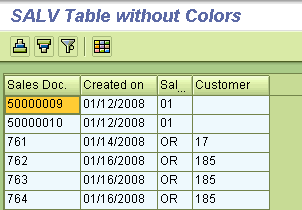 Than we have to set this Color Table in the object of the COLUMNS which contains the information about all our information (CL_SALV_COLUMNS_TABLE). Entire Row: To apply color to Entire row, we have to do the same thing as the applying the color to Perticular Cell, but we will not specify the FIELDNAME. This way system will understand that it has to apply the color to entire row. Entire Column: To apply color to Entire column, we have to get the specific Column from the COLUMNS object and than we need to set the Color Property of the Specific Column and we are done. In this example I need to change the output table sturcture as compared to previous discussion in this series, so I will provide the entire code which generate the output which has all three scenario. For test purpose, We will apply: Red color to Sales Doc Type in 3rd Row, Green Color to 5th row, Yellow color to Created on Column. Code snippet to generate the ALV with Colors using the SALV model. lo_col_tab ?= lo_cols_tab->get_column( 'ERDAT' ). LOOP AT ct_vbak INTO la_vbak. l_count = l_count + 1. I really like your exception handling. Very staightfoward. We created structure with table types as the components and populate each. We create a table-type of this structure. So now we have a table-of-tables. Is it possible to use cl_salv_table=>factory to display the table-of-tables?